So much is going on!!! Hope you are having a boo - d- ful evening. As before, I've been pushing through my STUFF and by golly making headway with the help of my friend, Bonnie. The best news is my niece, Kathy had a baby girl, Danica Lynn on Monday afternoon (October 26) and she is a cutey of course. I want to make her family a few meals that can be frozen and taken out of the freezer and cooked easily and have been checking out recipes on the net but thought hey why don't I ask my friends what their favorite recipes are. I am sure you all have some favorites that you like to make or find simple but pleasing. Want to share, I know I would benefit from your recipes and I am thinking others might too. So if you have a GREAT idea/recipe, please post it here in your reply. More soon...........those going off daylight savings don't forget to set your clock one hour BACK tonight as you go to bed. Still busy cleaning and de-stuffing. Gosh, where did I get all this STUFF?? Okay, okay I know I'm a shopper. I do realize when I find a deal for some reason I have to buy multiples instead of one. I SWEAR I am NOT going to do that in future. This week I had a handyman in and he hung window blinds and shelves for ALL MY STUFF. It all won't fit but then I will purge some more. I still have to clean out the garage cause YOU GUESSED IT I have MORE stuff! Then I will be ready to re-assemble the studio. Of course, since I had the shelves put up I had to put some stuff out and play a little so I decided to take a picture to share. Here's a little sneak peek. More soon, have a great weekend. Well, as my usual self, I am behind in blogging and so this is a belated shout out to Bonnie for her birthday. Luckily, I got to attend a creative session and celebration for her birthday so I don't feel anything but good about knowing such a great person and actually creating a gift for her. I was at a art show and saw a dress form display that was sooo cute. Bonnie and I had been out shopping one day and she had looked at some little dress forms for display but they were pretty pricey. So when I spied these little displays I knew I could use it as inspiration for her present. 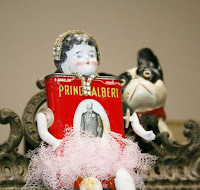 I used a paper maiche dress form, a brass stick, a match stick box, paint and clay and glitter. 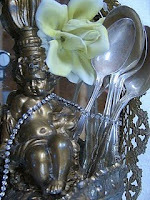 I took the brass candle stick and used those faux finishes to antique and rust the base. I used clay to shape a heart and used a letter "B" with glitter to personalize her dress form. I love it when something comes out as I imagined (lots don't ha ha) and I think Bonnie liked it so my job was a success. Happy Birthday Bonnie, glad you're my friend.